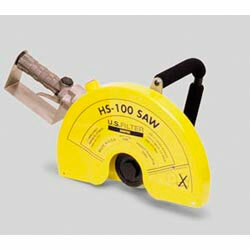 Handheld Air Saw Details - Quasius Equipment, Inc. The Hand Held Air Cutoff Saw is a portable saw powered by a pneumatic motor. It's a lightweight saw that features a 14" diameter blade, which can cut to a maximum depth of 4.5". Because it is powered by an air motor it is ideal for use in confined spaces like basements. There is no risk of electrical shock because electricity is not present. There is also no risk of carbon monoxide poisoning because there is no gas engine on this unit. Instead it uses compressed air supplied by an air compressor that is situated outside of the confined work area. 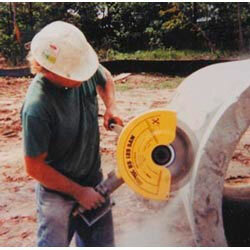 The air supply is fed to the saw via 3/4" inside diameter air hoses and can be run 200' without any pressure loss. The air supply can also be supplied by plant air if being used in a factory application but it is important to ensure that an adequate air supply is delivered to the saw or it just won't perform. This saw requires a minimum of 120 CFM (cubic feet per minute) of air volume. This is equivalent to a 30 HP electric compressor. Also the air lines to this unit cannot be smaller than 3/4" pipe size and may need to be larger if the run is longer. We suggest that any industrial account wishing to use this saw contact us first and we can help you decide whether or not your plant air is capable of handling this saw. The portable compressors that we rent for this saw are the 210 CFM diesel powered towable units that are pretty much standard in the construction industry. Please Click Here for a link to these air compressors. Most renters will be renting a diamond blade designed for this saw but there are customers who are frequent renters who have purchased their own blade therefore blades are not included in the rental rate for this saw. Please Click Here for a link to the diamond blade page. If you do not need to cut in an enclosed work area you may be interested in an electric or gas powered saw. The gas powered saw does have carbon monoxide exhaust and the electric saw must be used dry to prevent electrocution so they are not designed for basements or other enclosed areas but they do work well in open areas. Also, we have a walk behind air saw which is great for enclosed areas and makes it easy to cut straighter lines on a floor and save your back from having to bend over when sawing.